What explains the low number of 5-4 cases so far this Term? I have a pet theory — really just idle speculation at this point — that Chief Justice Roberts may have found a sweet spot aiming towards the middle by relying more heavily on the Marks rule than his predecessor Chief Justice Rehnquist. Promoting unanimity will not be an easy task, Roberts acknowledged, after years of "the personalization of judicial politics." He said that he had to emphasize the benefits of unanimity for individual justices, in order to influence what he called the "team dynamic." "You do have to [help people] appreciate, from their own point of view, having the Court acquire more legitimacy, credibility; [show them] that they will benefit, from the shared commitment to unanimity, in a way that they wouldn't otherwise," he said. Roberts added that in some ways he considered his situation—overseeing a Court that is evenly divided on important issues—to be ideal. "You do need some fluidity in the middle, [if you are going] to develop a commitment to a different way of deciding things." In other words, on a divided Court where neither camp can be confident that it will win in the most controversial cases, both sides have an incentive to work toward unanimity, to achieve a kind of bilateral disarmament. speeking of unanimity-was anyone else blown away by the fact that Virginia v Moore was 9-0. astounding! What if the CJ and other conservatives (save, likely, Thomas and Scalia) are more forward-thinking than that? What if he and the other moderate-ish conservatives on the Court realize that this is an election year (something that you and other scholars have acknowledged may play a role in the Court's decisions in Presidential election years), and one in which the executive could move back to Democratic hands. What if they are trying to avoid the appearance of being a strongly conservative Court to avoid a staunch liberal being placed on the bench the first chance Obama (or Clinton) gets? If the Court flies a bit more under the radar than they did last term, or even during some of the last Rehnquist terms, they might avoid a strong liberal being appointed to temper the conservatives. Whatever happened to good old inductive reasoning? Fact pattern --> result. Analogize or distinguish future cases. Everything else is dicta. This doesn't make sense to me. If Roberts intends to rely on Marks, wouldn't we see more plurality opinions and narrowing concurrences than we have? Of the 6-3 cases, only Crawford did not have an opinion of the Court. Of the 7-2 decisions, Baze was the only one without a majority opinion. While they both involved hot-button issues (elections and the death penalty), the result of these cases was not really surprising. If Baze and Crawford had been 5-4, we would have 18% 5-4, rather than 12%. Maybe that would be enough to silence the commentary that there have been fewer 5-4 opinions, but if the difference is really only two cases, is this really worth talking about in the first place? If true, this is truly dumb on Roberts part and will only contribute to move the Court even farther Left. Does he think that an appointee of President B. H. Obama will feel bound to his precedents just because he got one or two more votes for them? It really is sad that Roberts and Alito not only have demonstrated no interest in cutting back on the excesses of the Warren Court, but they are not even willing to stop the Court from moving even farther Left. JCM: Your analysis ignores the fact that the Democratic Party and the mainstream media will always portray the Court as a crazy conservative institution no matter what it does and the average American voter, having not read The Tempting of America, knows nothing about what objective, non-activist jurisprudence would be. Fascinating hypothesis, but it would be helpful to see a bit more of a track record before we should say this is what's really going on. Even just getting through the end of this term will shed a lot of light on the issue -- there are some opinions coming down that may be especially appropriate for a Marks rule application -- the issues beyond the threshold individual/collective rights RKBA determination in D.C. v. Heller come to mind, for example. What if they are trying to avoid the appearance of being a strongly conservative Court to avoid a staunch liberal being placed on the bench the first chance Obama (or Clinton) gets? Which conservative Justices are going to retire at the beginning of the 44th President's term? I figured JPS or RBG was next to retire, so the most Obama can do is replace center left or left (respetively) with left. If true, this is truly dumb on Roberts part and will only contribute to move the Court even farther Left. . . . It really is sad that Roberts and Alito not only have demonstrated no interest in cutting back on the excesses of the Warren Court, but they are not even willing to stop the Court from moving even farther Left. Jerry, you're missing the essential mathematics here. Thomas + Scalia + Roberts + Alito = four votes. Four votes can get cert granted, but it can't control the direction of decisions from a 9-Justice Court. I love how the theme of last year's coverage of the Court was "Why so many 5-4 cases?" And this year the theme is "Why so few 5-4 cases?" Those are the reasons for the multitude of 5-4 cases last year and the paucity of 5-4 cases this year. Sorry it's not more exciting that, but it's a matter of basic statistics. Next Term, I hope Chief Justice Roberts and Justice Breyer, by sheer coincidence, are seen in public on more than one occasion wearing the same-colored tie. That way, the theme of next year's coverage can be, "Why so many matching ties? What does this mean for the Court's jurisprudence?" Then, when by sheer coincidence, they stop wearing same-colored ties, the theme will become, "Why no more matching ties? What does this mean for the Court's jurisprudence?" Perhaps Roberts started thinking along those lines after Rapanos, where he specifically mentions Marks. Unless you are a sitting Supreme Court Justice, I would tend to think your sense of certainty is unwarranted. Terrivus could be Sandra Day O'Connor and still have some inside dirt. Though Terrivus seems to forget that the Justices only wear a couple of different tie colors between the 9 of them. I think this is the general uniform. 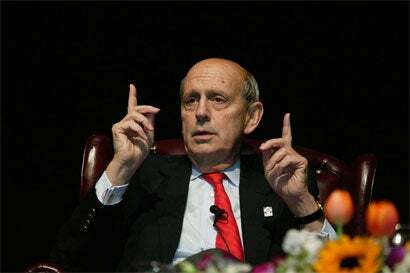 And here's Justice Breyer with the same almost monochrome bright red tie. 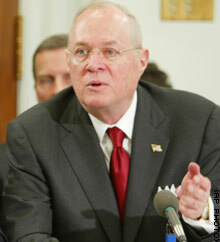 And Justice Kennedy too, though with a lighter-colored suit. I leave it to the others to unravel the full conspiracy, but the speculation should have started long ago. In all seriousness, Professor Kerr's analysis makes a lot of sense to me, and several of the commenters appear to have missed the caveats in the final paragraph and throughout the post. I don't think that SCOTUS adheres to the bell curve. There is no "natural" number of 5-4 cases. It may be too soon to write the obit for 5-4's, but it has nothing to do with the normal distribution. You've found me out -- I'm sitting here eating my yogurt while checking the box scores for my beloved Chicago Cubs and lamenting the closing of Ristorante AV. Go Phillies! I don't think I buy Orin's hypothesis, but it's an interesting one, and a useful contribution to the current debate about why we're seeing -- so far -- fewer 5-4 decisions this Term than last. I don't pretend to have a fully formed theory in which I have any great confidence, but I do think the surprisingly lopsided votes in yesterday's employment discrimination cases may reflect a renewed commitment to stare decisis on the part of some of the Justices. The weight given to the 5-4 Jackson decision by the Chief Justice, Justice Kennedy (who dissented in Jackson), and Justice Alito is noteworthy. Several people, including Terrivus in this thread, question whether there is any phenomenon worth attempting to analyze at all, given that the Term is not over. I think the raw data suggest that there is something worth analyzing. In OT06, through the end of May, there had been 47 decisions, of which 14 were 5-4. In OT07, though the end of May (which is over for decisional purposes, the next opinion day being June 2), there have been 43 decisions, of which only 1 was 5-4. Among those 43, two were affirmances by an equally divided Court, so a fair analysis of the data must treat the number of 5-4 votes so far this Term as 3/43, compared to 14/47 at the same time last Term. Someone with access to statistical tools could tell us whether that difference is statistically significant at the 90% or 95% confidence level. I haven't done the calculations myself, but my instinct is that the null hypothesis -- that the "true" likelihood that any decision will be 5-4 is the same each Term, and that variance between the samples explains the observed differences -- will have a rather low probability. I should acknowledge that one could view the data slightly differently by counting Stoneridge, decided 5-3 with Breyer recused, as if it were a 5-4 decision, making this Term's numbers to date 4/43. But I don't have confidence that Breyer would have voted with the minority in Stoneridge, nor would this sort of adjustment necessarily result in an apples-to-apples comparison -- there was a 5-3 decision, Watters v. Wachovia Bank, in April 2007. Perhaps one should just eliminate both cases from the denominator and compare 3/42 this Term to 14/46 last Term. The suggestion that 5-4 decisions increase at the end of the Term is accurate but not a complete explanation. Last Term, in June, there were 10 5-4 decisions out of 26 (39%), compared to 14/47 (30%) through May. What was more dramatic last Term was that all 10 5-4 decisions in June had majorities consisting of either Roberts-Scalia-Kennedy-Thomas-Alito or Stevens-Kennedy-Souter-Ginsburg-Breyer, with 9 of the 10 being the former. It will be interesting to see if this Term plays out similarly or differently. One last data point, unrelated to the 5-4 decisions but responsive to Orin's point about agreement between pairs of Justices. The Roberts-Kennedy agreement percentage has dipped slightly since the May 1 statpack. But the Souter-Breyer agreement percentage has really fallen: those two Justices disagreed 4 times in May out of 8 decisions, whereas they had disagreed only 3 times the whole Term before that. I don't think that SCOTUS adheres to the bell curve. There is no "natural" number of 5-4 cases. Why wouldn't it adhere to the bell curve? Suppose you took the last 40 Terms and determined the numbers of 9-0, 8-1, 7-2, 6-3, and 5-4 decisions. You could even account for cases that split without a majority. You don't think that the data would show a general pattern of the distribution of splits, per year, over time? I bet it would. Some years might show a whole bunch of 5-4 decisions; others might show very few. Some years might show a whole bunch of unanimous decisions; others might show very few. But I bet the year-over-year results would show a distinct bell-shaped pattern. That doesn't mean that within each year there's a normal distribution of splits. I would imagine the data show that a typical year contains more 9-0 and 5-4 decisions than 7-2 or 6-3 decisions. But that's a different inquiry; I'm talking about split distributions over the years. Phooey. What does Roy Englert know? Also, the fact that there's a statistically significant difference between the number of 5-4 decisions this Term and last Term -- if there even is such a difference -- still doesn't mean that there's not a normal distribution. Both Terms may well be at the ends of their respective sides of the bell curve. Or, one Term might be much closer to the mean, and the other is the outlier. The problem, though, is that -- at least for purposes of analyzing the Roberts Court -- we're still dealing with a sample size of 2: OT06 and OT07. (I'm not counting OT05, because SOC and SAA split the year.) So who's to say whether this year is the outlier or last year was? Or whether they are both outliers, and the mean lies somewhere in the middle, such that this Term is a merely an illustration of regression to the mean (one outlier offsetting another outlier)? My question is not whether SCOTUS decisions have historically followed the bell curve--even if they had, it wouldn't mean anything about the future. We would have an inductive fallacy: just because the court roughly followed the curve in the past does not mean it will in the future. And, by the way, "why wouldn't it adhere to a bell curve" is the wrong question to ask. Until something is shown to be regular and shown to have some reason to be regular, assuming regularity is unwarranted. The terms and the cases within the terms are (largely) independent events. What could possibly cause the justices to adhere to a bell curve in their voting patterns? Can you imagine a justice changing her vote because there had been too many 5-4's already? Can you see the court granting cert in easy cases to make sure to reach the 7-2 quota? Is there a subliminal desire to balance the vote distribution? If there is no causal mechanism, the appearance of regularity is mere coincidence and is therefore deceptive. The argument that Chief Justice Roberts is trying to change the historial distribution of voting patterns cannot be refuted by a coincidental distribution. However, I agree that there far too little data to adequately test the hypothesis. Um, based on this paragraph -- if not your entire comment -- I honestly don't think you understand what a bell curve (normal distribution) is, what it means, and the information one can and can't draw from it. The demands of a workaday world don't permit me the time fully to explain why, so unfortunately I'll have to leave it at that. (Okay, I can't resist a quick one: that past events fall into a normal distribution has absolutely nothing to do with the distribution thus "causing" future actors to adhere to it, as the second sentence of your paragraph seems to presuppose). Orin, I think your reasoning is sound, but your faith in the meaningful, much less fair application of the Marks rule is difficult to understand. I agree that Roberts is shooting right-center and attempting to keep Alito and Kennedy at his hip, but why are you so confident that his opinion is nonetheless the narrowest? The Court may be relying on the Marks rule with greater frequency (though it completely ignored it in some big cases like Grutter), but it has never defined "narrowest grounds" and you seem to take for granted that because Roberts's opinions are less conservative (less rigt/ center right) that they are narrower, but this does not necessarily follow. Linda Novak has written that narrowest can be understood in terms of the opinion that speaks most directly to the facts of the case at hand, that is not absolutist, and that does not announce a test of general applicability. I will grant you that Roberts's opinions tend to be less absolute than the Thomas/Scalia concurrences, but they are certainly as broad and generally applicable as any other constitutional test. Could you explain why lawyers should take any guidance from these fractured opinions, much less assign defining value to an opnion that is not (in any discernable way) the narrowest? Before I am willing to applaud Roberts's middle-ground efforts and embrace of the Marks rule, I will need to be persuaded that the Court actually intends to define and consistently apply Marks (some circuits do not apply any version of the Marks rule that resembles the formula you describe, and the DC Circuit seems to embrace only a common denominator -- i.e., there is implicit majority support for the ratio decidendi -- to the Marks rule. How do you define "narrowest grounds"? One additional point re the Marks rule. The posting concludes by noting that "Aiming for the center-right secures the center, and securing the center makes the center-right opinion the consistently controlling opinion under Marks." But the SCOTUS has never held this, and the Marks rule as quoted earlier in the post, makes no mention of this idea that the most "centrist" approach will govern. In my view, "centrist" and "narrowest" are materially different. I am familiar with the line of reasoning that suggests that a "predictive model" should be used when considering what is the narrowest grounds. And as I understand it, this approach defines narrow by attempting to ascertain which opinion is likely to be the 2nd choice of the most justices -- i.e., would Scalia/Thomas prefer the Roberts concurrence or a concurrence by Stevens or Souter. To be sure, when Roberts's opinion enjoys 3 votes, it is pretty safe to "predict" that if another similar issue comes before the Court, the votes of the plurality opinion justices (Roberts Kennedy and Alito, as identified in your posting) would dictate the result. But what does this say about narrowness? This is merely precedent by personel. Moreover, I can't find a single Circuit that has endorsed this predictive approach to defining "narrowest." There seems also to be few if any in depth academic pieces defending this approach. I think of it like ven diagram: The narrowest grounds is the grounds with the smallest area on the diagram for that side. FWIW, I think these concepts do have fairly well-understood meaning among the Justices and their clerks. There can be difficult cases where the narrowest opinion isn't clear, sometimes for the reasons you mention, but in some cases there appears to be evidence that the Justices may have reconfigured their votes to avoid that when possible..
Oh, also, the center-right opinion generally ends up being narrower because it is often an effort to draw lines within precedents that point in various directions, while the Scalia/Thomas opinion is usually more of a first-principles rethinking that explains why the Court shouldn't even be trying to draw lines here at all. Easy Terrivus. I haven't said that I don't think you understand what randomness is and how the bell curve is grossly over-applied to situations where it doesn't tell us anything. I understand the normal distribution quite well. I know it well enough, in fact, to realize that it can be applied to situations in which it gives the illusion of clarity where none exists. The small set of available outcomes in SCOTUS cases (i.e., 9-0, 8-1, ...) makes it statistically likely that the outcomes will fit a bell curve. However, if the outcomes match the bell curve because of some unimportant reason (like the small number of possible outcomes), then distribution we derive from the data tells us precisely nothing about the outcomes of future cases or terms. If there is no reason for the curve, then it has no use. If it has no predictive value, then it's just a party trick and not worth the time it takes to draw. Of course it would be valuable to compare the curves of a Roberts term to a late-Renquist term to see if the Roberts results are significantly different, but there is no reason to assume that the distribution will fit the normal distribution over time where nothing causes the distribution to fit a normal pattern. If Roberts really really is working a paradigm shift, the distribution would no longer be normal, it would be skewed, right? The bell curve and all the useful measures we derive from it (especially variance, standard deviation, and regression) are only useful if we have reason to believe that the future data points will fit the same distribution. If the mean (or I guess the median, in this case) moves as time goes by and especially if it moves in response to a sudden change, we can't assume a distribution is normal. Simply saying a data set fits the normal distribution begs the ultimate question. I have studied John Roberts in-depth, listening to far too many of his oral arguments before the Supreme Court and perusing far too many of his memos. Basically, what Orin describes is Roberts' approach to appellate litigation. That is how he litigated cases, and it is no surprise that he writes opinions in the same way. Tie all the relevant cases together in a plausible and very particular fashion, find a procedural escape if possible, and ask for far less than your opponent. He wrote a piece on it, which I cannot find, but included a line to the effect of, "In 50% of cases, the client is wrong, but appellate advocates still have to persuade judges to find in their client's favor. Here's how." Allow me a hypothetical. You have said that the Court's splits should have not just a regular distribution, not just a reliable average distribution, but The Normal Distribution. You have also gently mocked the idea that I should expect this rather remarkable statistical occurrence to have a cause. I confess that I don't understand your argument, but you seem to suggest that this rough bell shape should appear when the splits of several terms are combined. But here's the hypo: instead of breaking the cases down by term, break them down alphabetically. Wouldn't we be just as likely to see a rough bell shape in the vote splits for all cases where the appellants name started with A (assuming that appellants with A names are randomly distributed)? In other words, isn't the appearance of a bell curve a mask for what's really happening--a series of independent votes on independent issues unrelated to the case or term that came before? Some years have lots of close cases, some have few; but that does not mean that we can predict the vote totals of future terms by appealing to a purely numerical average. Any set of numbers will have an average, but that does not mean that what caused the average to appear in the prior data will hold for future data.